I have always been fascinated by biology and as soon I heard the theme for this reveal I knew what my inspiration would be, namely the brains neurones and dendrites. They connect in so many complex ways and in such depth especially when seen through high magnification. I wanted to try and convey this depth and complexity but at the same time make it exciting to look at, using the infill quilting to draw the observer near. In the early stages I did a little google searching of the word connecting and one of the hits was the phrase connecting the dots. It just seemed to be appropriate as a title for my quilt. It is essentially a whole cloth quilt. I chose a simple pure colour triadic colour scheme against black. This I hope gives it a graphic quality. 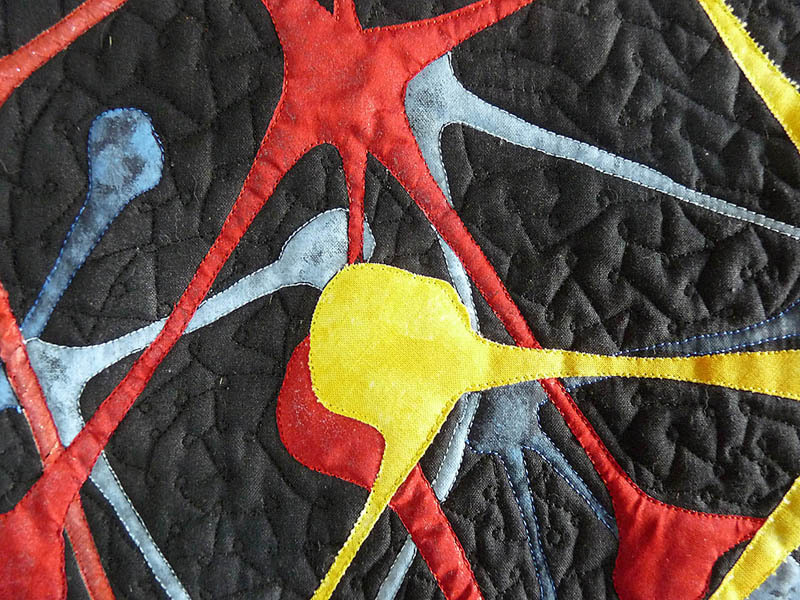 When designing this quilt I wanted to try and convey the interconnected nature of the neurones and opted to use colour to try and separate the various dendrites. Sometimes this proved to be difficult. Hence the use of two shades of the same colour. 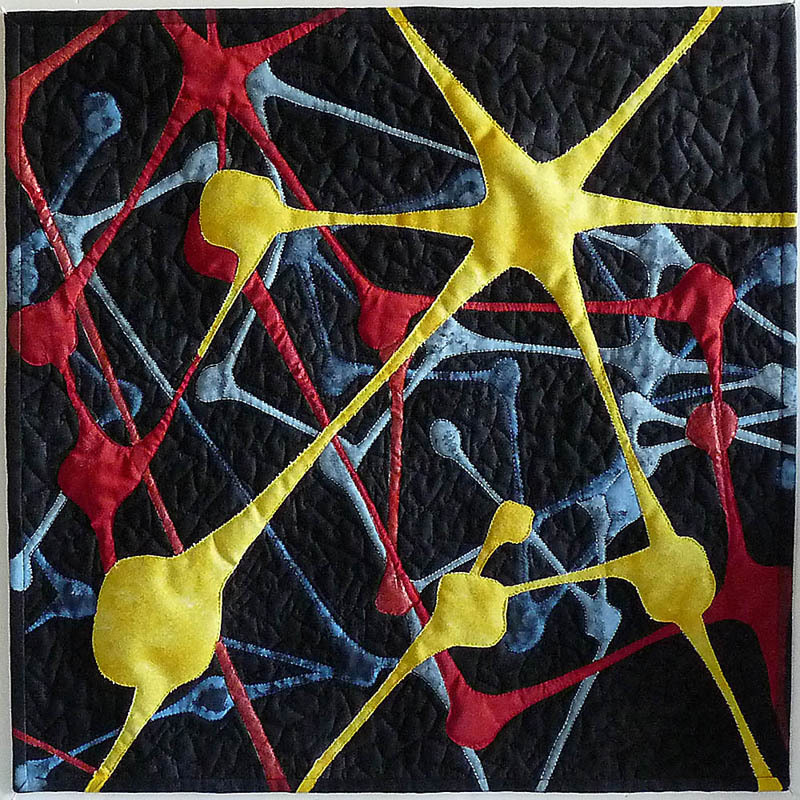 The quilt was created in layers starting with two separate stencils with which I laid down the two layers of blue fabric painted dendrites. Next came two sheer layers, one of a painted fusible and one of a fused silk crepe. Finally for the top layer I chose a cotton marble fabric. 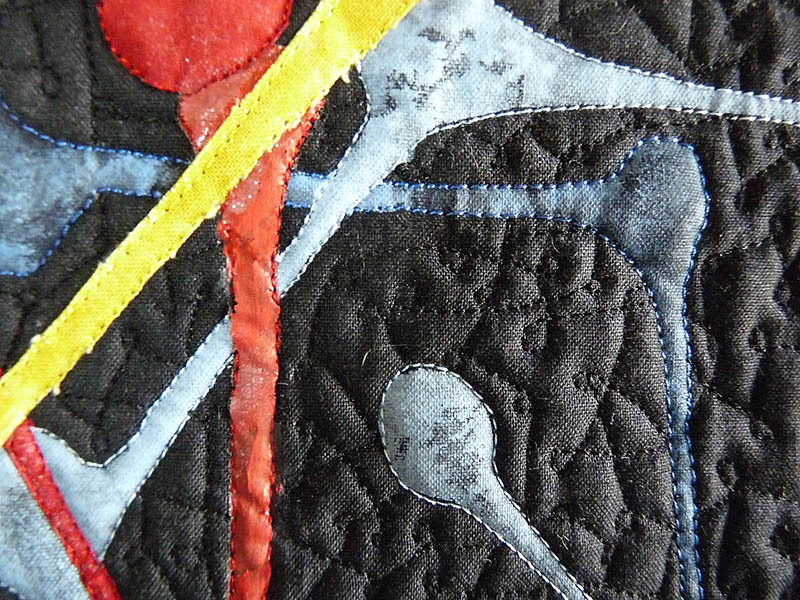 For the quilting I simply outlined the design elements and then infilled with a simple quilting design intended to look like more neurones. Overall I am very happy with this quilt. I like its simplistic feel. Gaye, this is a really striking design and conveys the subject in a light-hearted way. I really like it! Gaye, what a tremendous quilt, I like the fact that you researched your subject and you interpretation is a credit to your quilting and design skills. Cheers.